Home › Featured Users › Newspapers: A Genealogists Treasure Trove! I should probably start by introducing myself. Hello, my name is Linda, and I’m a genealogy addict! I started researching and recording the genealogy of my family in 1988. Although I was lucky enough to have known my grandparents and to have met one of my great-grandmothers, I really didn’t know many specifics about who they were or where they came from. All I had to go on were some family stories and a lot of photographs. Genealogists work backward in time to find out more about ancestors. We diligently search records that document facts—birth, death, marriage, divorce, place of residence, military service, land ownership, immigration, etc.—looking for information about our ancestors. We keep searching, looking for the type of things we don’t find in those records, the daily activities of those ancestors. Where were they between census years? Who did they socialize with? Did they travel for enjoyment? Were they involved in local politics? Did they participate in organizations? Did they have children that didn’t show up on a census? Information about our ancestor’s daily activities can often be gleaned from newspapers. Newspaper stories can provide a richness and context to a family history beyond the recitation of names and dates. Early newspapers tended to be more locally focused in the type of news items they published. The Historic Oregon Newspapers collection and the Library of Congress Chronicling America Historic American Newspapers are treasure troves of information for genealogists. Both are online and fully text searchable. I use the Historic Oregon Newspapers collection extensively while researching Oregon ancestors. The Lincoln County Leader is a great resource for my extended family on the coast. For Douglas County, The Plaindealer, The Douglas Independent, and the Roseburg Review are excellent sources. To illustrate several of the ways that newspapers can provide information about ancestor’s daily activities, I’ve chosen articles from the Douglas County papers. 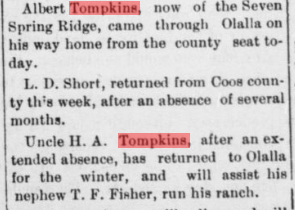 Using documented facts as background and to create a timeline, the newspapers provide a look at the interactions of my great grandfather, Herbert A. Tompkins, with family members who left Iowa and settled in both Douglas and Coos County, Oregon. 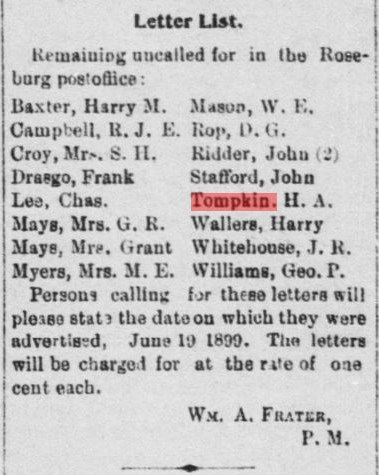 Finding Herbert (“Tompkin, H. A.” [sic]) on the list of unclaimed letters at the Roseburg, Oregon post office published in The Plaindealer (June 19, 1899) helps establish when he arrived. Small mentions of the travels and social activities of area residents were a large part of the content of local papers. A mention in The Plaindealer (July 24, 1899) places T. F. Fisher and H.A. Tompkins in Roseburg on business the previous Saturday. In the 1900 census, Herbert is living with Vianna and William Matthews (his oldest daughter and son-in-law) in South Slough, Coos County, Oregon. By 1903, he was back in Douglas County as documented in the “Olalla News” column in The Plaindealer (December 10, 1903). Both Herbert and nephew Albert Tompkins (son of Herbert’s brother Elias) are mentioned. T. F. Fisher is also identified as Herbert’s nephew in the column. Fisher is the husband of Margaret Amelia (Millie) Tompkins, Albert’s sister. The use of the word “Uncle” in the context of the clipping may be a respectful reference to Herbert’s age (57). Have you ever wondered how your ancestors did in school? You may be lucky and find a School Report. 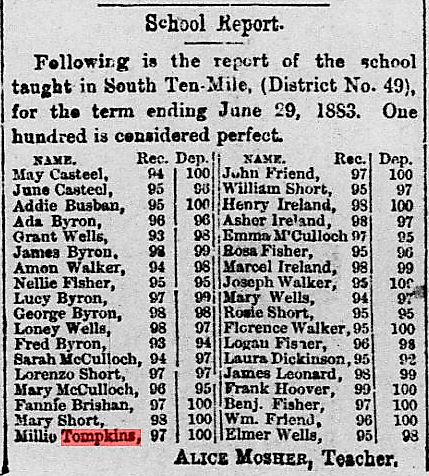 This one is for the South Ten Mile School and was published in The Douglas Independent (July 21, 1883). In the list, “Rec” is their record (grade/class standing), and “Dep” stands for deportment. There are some other interesting relationships and connections among the students in this school. Some family groups are easy to see; they share a last name. What is not obvious is that Ada Byron and Millie Tompkins are siblings, the daughters of Elias Tompkins. Previous research confirmed their relationship and that between their mother’s death in 1876 and the 1880 census, they had been fostered by John Byron and his wife. The report lists Ada as using the Byron surname while Millie, her older sister, still maintains the Tompkins surname. Other names in this list complement facts found through census data. The McCulloch’s are siblings and nieces of John A. Freeman (married to Herbert’s first wife). The Fisher children are all younger siblings of T. F. Fisher who marries Millie Tompkins in September 1890. Newspaper articles can sometimes surprise us with what they reveal about our ancestors. 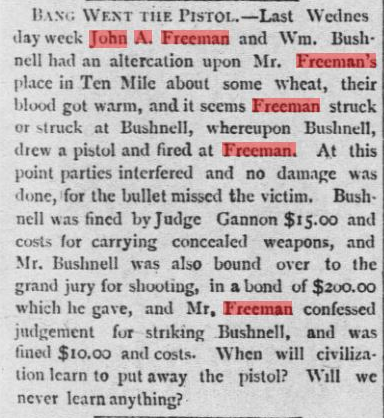 This article appeared in the Roseburg Review (September 3, 1886) about an altercation involving a gun. I think the editorial question in the last line of the article is worth noting. These are only five representative articles describing the activities of these ancestors and their families. What else have I found? Obituaries, estate filings, marriage notices, social gatherings, family tragedies, visits to and from family members, law suits, public works assessment notices, and advertisements for the rental and sale of property. I use this type of information to provide depth and context to the other research I’ve done when writing and sharing stories with my family. Welcome to my addiction. I wish you good hunting and a great adventure!